Elliot Castle, property expert at WeBuyAnyHome.com, has seen many properties succeed or fail on the market. And now he has explained to Express.co.uk what sellers should be doing to make sure their home gets the best possible price. He said: “When selling your home, it is vital to present it in a way that entices buyers and encourages a quick sale. However, you don’t have to spend a fortune or renovate to help future buyers visualise the hidden potential in your property. “If you prepare your home in the right way, you are not only more likely to sell the property faster, but you might increase the value too. The front door is the first thing any potential buyer will notice, so it is important to make first impressions count. If your front door is looking a bit shabby, buy a new doorknob, a brass letterbox or a stainless-steel house number; these small touches can instantly make your home appear more welcoming. If you need some inspiration, browse Pinterest or Instagram – you’ll be surprised how many people share beautiful imagery of exterior doors. 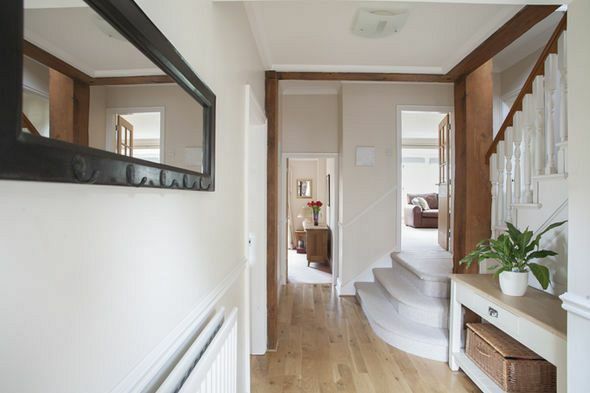 Once inside the house, the hall is the first space the buyer sees, yet it is often narrow, cramped and full of clutter such as prams, bikes and trainers. Ensure the hallway is decluttered and tidy to stop it looking too cramped, and hang a mirror on either side of the wall, to give the illusion of a bigger space. A vase of fresh flowers in the hallway also goes a long way and can add an instant homely feel to it, which will make potential buyers feel relaxed. A fresh lick of paint goes a long way, as it helps keep the interior of the house or flat looking neat and fresh. Never underestimate the power of white walls to not only give the illusion of a bigger space, but also an all-over clean and slick look. A fresh coat of paint will cover up any marks that have amassed on the walls over the years and don’t forget to pay the windows some attention with a good clean, inside and out. If you’re struggling to find space to hide everything away, why not consider having a clear out and selling everything you don’t need at a car boot sale? That way you’ll earn some extra cash for the home improvements. Adding the perception of height to your room is the perfect way to make it seem like you have a larger space. Tables and chairs that are set on high legs will also elevate the room to help create a more spacious environment and a good way to draw the eye up is by hanging standout pieces on the walls such as bold paintings and prints. Dark colours can easily make a space feel small. If your home has dark coloured walls add cream and white accessories like rugs and throws.